A mix of yummy candles, cupcakes, and sprinkles are the perfect way to celebrate any occasion. 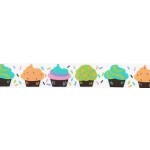 Ink colors are Turquoise, Orchid, New Apple, Creamsicle, Hot Pink, and Brown on solid white grosgrain ribbon! 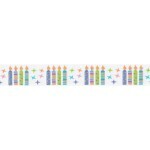 Cupcakes/Candles are printed on one side and reverse to corresponding solid ribbon. Hand washing is recommended to keep them bright, low iron on opposite side. They may show wear from heavy handling as any print would. 100% Polyester, machine wash, low iron on opposite side.